In spring 1999, The Spokesman-Review learned that a group of brokers called Clearwater Land Exchange was quietly putting together a 2-million-acre land exchange that would cover vast areas of federal, state and private lands across Idaho. Clearwater was meeting with sportsmen, conservation groups and politicians to tie up support for their scheme. They had maps and detailed plans. They hired a big-name public relations firm to shop it to the public. But they had yet to speak with the agencies whose lands would be involved. Once exposed in the pages of The Spokesman-Review, Clearwater dropped the deal. A few months later, a Spokesman-Review reporter found that some of the same guys had earlier reaped a huge profit courtesy of U.S. taxpayers when they bought a coveted 520-acre parcel of old-growth cedar on Priest Lake for $1.55 million, and later traded it to the U.S. Forest Service at a value of $8.75 million. Idaho is not alone in hosting land exchanges. Wherever there are swaths of public lands, there are land traders ready to go to work. Most Western states have seen dubious deals, and the U.S. Government Accountability Office reported in 2000 that land exchanges were harming the public interest. Not every exchange is a shady deal, but experience has taught people who value public lands to be deeply skeptical of these projects. It is within this context that Idahoans were confronted with the Upper Lochsa land exchange proposal. The overall plan was to consolidate checkerboard lands to simplify land management. 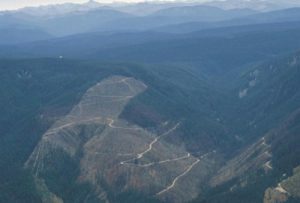 Western Pacific Timber would trade 39,000 acres of mostly cutover land they own within the boundaries of the Nez Perce-Clearwater National Forests for 18,000 acres of public land (and lots of trees) in those forests, and in the Panhandle. It seemed like a classic stumps-for-trees exchange. There would be value in the public acquiring WPT’s lands, but what would the public lose? People living in the Palouse Ranger District were especially concerned because that district would pretty much be privatized. Nevertheless, over seven years, hundreds of citizens participated in the U.S. Forest Service’s analysis and public involvement process for the trade under the National Environmental Policy Act. Many advocated the outright purchase of the WPT lands. Unfortunately, the Forest Service badly bungled its approach, at one point issuing an analysis of an acre-for-acre exchange at the behest of Idaho County commissioners who didn’t want any net gain in public land. Such an exchange is illegal because land trades are based on equal land value, not acreage. This foray outside the law didn’t bolster the public’s confidence in the Forest Service. Worse, it raised the specter of land-exchange legislation because that is the only way to get a trade through with such special provisions. Opponents of that trade understand that this opens the door to all manner of manipulation, and closes the door on the public. Flawed though it can be, the agency process for land trades involves the public every step of the way, and citizen input really can make a difference in the outcome. Once a deal goes to Congress though, your only recourse is seemingly futile letters and phone calls, or the expensive option of flying out to Washington, D.C., to give five minutes of testimony. That is, if you are invited. Fears were recently confirmed when Idaho Sens. Jim Risch and Mike Crapo and Rep. Raul Labrador asked the Forest Service to suspend the exchange so that they can put together legislation that would include “additional authorities” (read: special provisions) for the Upper Lochsa trade. The list of “principles” guiding their effort is mostly a bland litany of good intentions, but one standout in the list is that the exchange “must provide a net economic benefit to the citizens of Idaho County.” That goal is sufficiently off the rails of a normal land trade to signal that the legislation will end up a treasure trove of special language aimed more at gifting constituents than creating a better land-management situation. The Forest Service largely failed the public on this land trade, and Congress is almost guaranteed to make matters worse. The best outcome at this juncture would be for both the Forest Service and the Idaho delegation to walk away from the exchange. Time, energy and public dollars would be better spent finding a way to purchase the lands in the Upper Lochsa that should be in public hands. Janine Blaeloch is founder and director of the Western Lands Project in Seattle. Gary Macfarlane is executive director of Moscow-based Friends of the Clearwater.